Definition at line 355 of file xmlstorage.d. Definition at line 409 of file xmlstorage.d. Definition at line 365 of file xmlstorage.d. 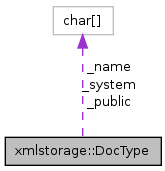 char keyword = str[start..i]; // "PUBLIC" or "SYSTEM"
Definition at line 357 of file xmlstorage.d. Definition at line 360 of file xmlstorage.d. Definition at line 361 of file xmlstorage.d.